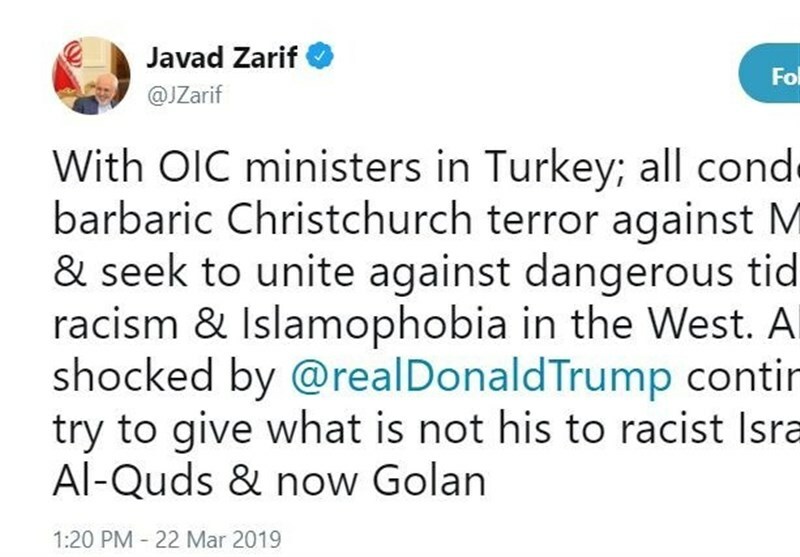 TEHRAN (Tasnim) – Iranian Foreign Minister Mohammad Javad Zarif, who is in Turkey to participate in a meeting of the Organization of Islamic correlation, said all OIC ministers have been shocked by US President Donald Trump's decision about the Golan Heights. Iranian Foreign Ministry Spokesman Bahram Qassemi strongly condemned Trump's statement on Friday, saying his “arbitrary decisions” plunge the region into new crises. Russia's Foreign Ministry also responded Friday morning, saying that a change in the status of the Golan Heights would be a direct violation of United Nations decisions.